Believe it or not, I think I'm finally going to be able to wrap up the posts on our New Hampshire/Maine vacation that my mom, Jamie, and I took over two months ago! And look, I managed to write less than 20 posts about a 5-day vacation - it's an almost-Christmas miracle! A word of warning, though - being that this is my last post it's also going to be a rather lengthy one as I've got several lighthouses to share with you and you know me, I tend to blather at the keyboard and go on and on and on. I'll try to be succinct, though - honest! So, our last day in Maine (which was actually on October 10th) found us heading back down the coast in the direction of Connecticut and home but along the way we were going to be in search of several of the most photographed lighthouses in Maine with the first stop being at Fort Williams Park at Cape Elizabeth just south of Portland. 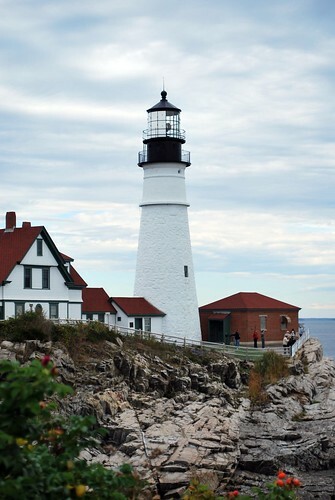 The park is the home to Maine's oldest lighthouse and extremely popular tourist attraction - Portland Head Light. As you can see from the picture above which shows the parking area in front of the lighthouse (never mind the one that you can't see that was behind me! 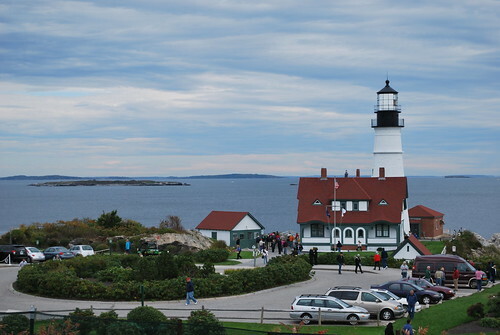 ), Portland Head Light is the most-visited lighthouse in Maine. As a matter of fact, there were so many people there on that Columbus Day Sunday that it was wall-to-wall people in the tiny gift shop (that small building to the left) and the museum which is located in the old keeper's house. No wonder my mother opted to stay in the car and read her book! That wasn't the only cruise ship in the area either as we'd passed a large Royal Caribbean ship docked in downtown Portland on our way through the city to the lighthouse. 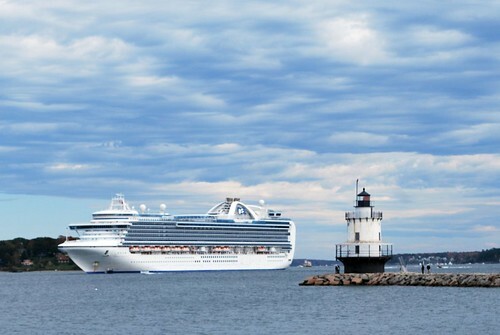 Apparently Portland is a very popular spot for those going on the New England/Canada cruises and Portland Head Light is a very popular part of a shore excursion. It's easy to see why, though just by taking a look at the shoreline north of the lighthouse. 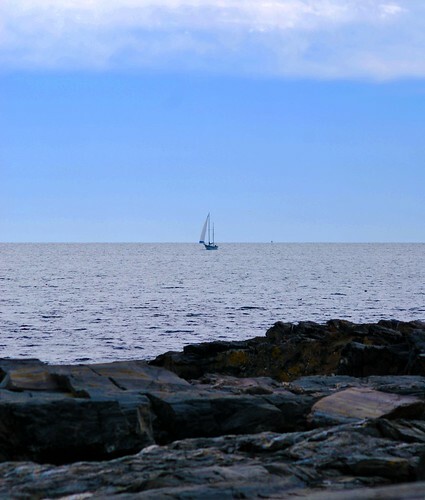 I'm pretty sure that's the image a lot of people conjure up when they think of the rocky Maine Coast. 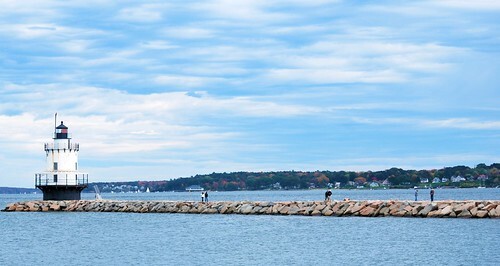 Before I tell you too much about Portland Head Light, as an added bonus that I didn't even know about until we got to Fort Williams Park, there's another lighthouse that you can see in the distance in Casco Bay at the entrance to Portland Harbor. 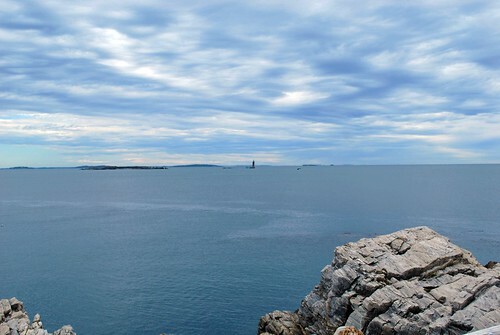 Ram Island Ledge Lighthouse is located about a mile from Portland Head Light and is an active navigation tool using a 300mm solar-powered light that was installed in 2001. Even with my 300mm zoom lens, this picture below is about the best that I could get of the 77-foot tall lighthouse that was built in 1905 on a granite ledge that is only visible during low tide. 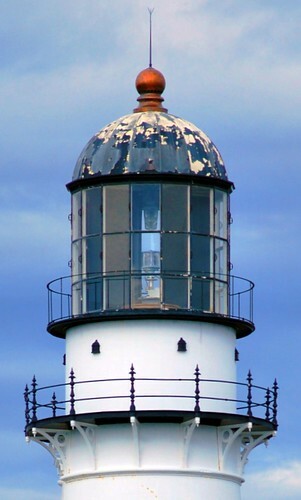 When the light was first lit on January 23rd, 1905, it used a Third Order Fresnel lens that was mounted on a clockwork mechanism that rotated the lens to give the light its distinctive flashing pattern; the mechanism had to be wound every hour-and-a-half by the keepers of the lighthouse who worked in shifts of two. 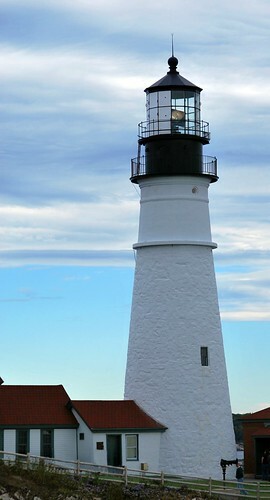 In 1958 the light was electrified via an underwater cable extending out from Portland Head and in 1959 the Coast Guard removed the keepers from Ram Island Ledge as the light and the fog signal that was added on August 28th, 1905 were monitored remotely by the keepers at Portland Head Light Station. Speaking of Portland Head Light ... its history goes way back to 1787 when the General Court of Massachusetts provided $750 for the construction of a lighthouse at Portland Head. 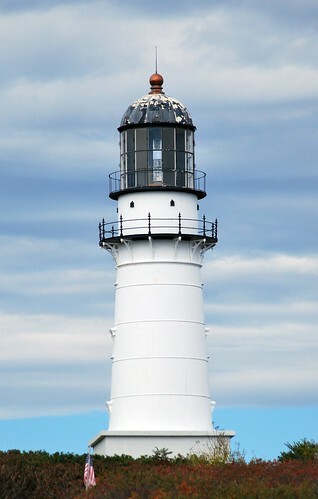 The original tower, measuring 72-feet from its base to lantern deck and lit with 16 whale oil lamps, was first lit on January 10, 1791 after the government took over the responsibility of all lighthouses in 1790 and President George Washington commissioned the light and providing $1,500 for its completion. In 1855, a Fourth Order Fresnel lens replaced the whale oil lamps and reflectors and a fog bell tower with a 1,500-pound bell was installed, the lighthouse tower was lined with brick, and a cast-iron spiral stairway was built. After 40 immigrants died in the wreck of the Bohemian (a Liverpool vessel), improvements were made to the tower and it was raised 20 feet as well as outfitted with a 7-foot tall Second Order Fresnel lens. The Second Order lens remained in operation until 1958 when it was replaced by aerobeacons. The light is now part of the museum that is located in the former 1891 keeper's quarters but unfortunately, I didn't get the opportunity to see it. 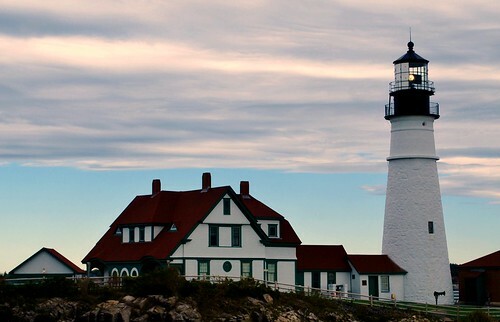 On August 7th, 1989, Portland Head Light held a ceremony to commemorate the 200th anniversary of the creation of the Lighthouse Service and on that same day, the light was automated and the keepers were removed. 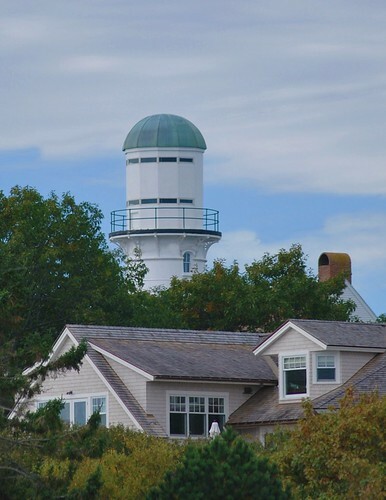 In 1993 the property was deeded to the town of Cape Elizabeth who maintains everything except for the light itself and the fog signal, both of which are maintained by the Coast Guard. 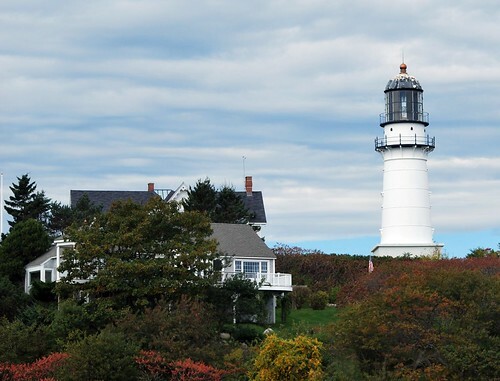 Should you ever find yourself in the Portland area, the museum is open from June to October but the lighthouse itself can be seen anytime of the year from Fort Williams Park. As a matter of fact, there are some stunning pictures of it taken during the winter - something I think I wouldn't mind doing myself sometime if I ever get the chance! Leaving Portland Head Light and - what I hoped - would be the crowds behind, we then made our way over to Southern Maine Community College to find Spring Point Ledge Light which is located on the adjoining property. 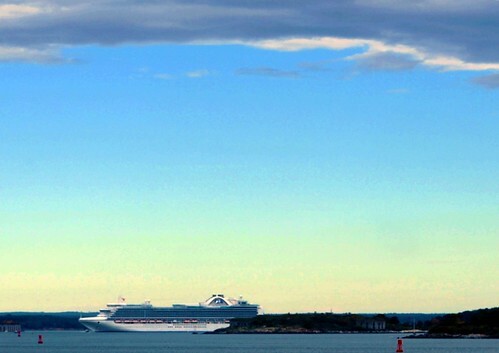 Remember the Princess cruise ship that we could see from Portland Head Light? Guess where we got a closer view! 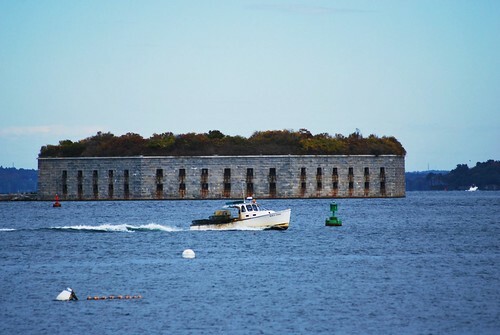 Spring Point Ledge is a dangerous obstruction on the west side of the main shipping channel from the south into Portland Harbor - a dangerous obstruction that caused many ships to run aground in the early days before the lighthouse was built. In 1891, seven steamship companies finally convinced the federal government that a lighthouse needed to be built and on May 24th, 1897, Spring Point Ledge Light was lit for the first time. 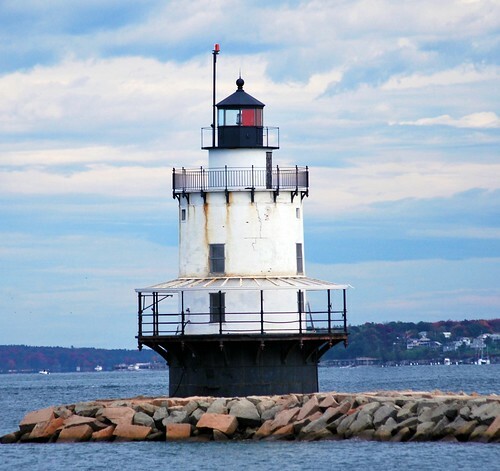 Considered to be a "sparkplug" style, the light originally stood 900 feet off-shore until a granite breakwater was built in 1951 to join the light to the mainland. Automated in the 1960s with a 300mm optic lens, the lighthouse originally used a Fifth Order Fresnel lens that, prior to being electrified in 1934, was fueled via a 239-gallon kerosene tank that was kept in the oil room in the basement of the four-level lighthouse. 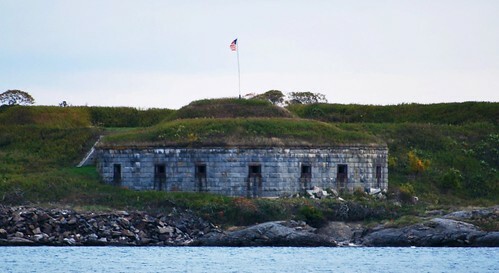 I would really liked to have had more time to explore the area as - unbeknownst to me - it turns out that there are old Civil War forts located in Portland Harbor! Who knew? Well, definitely not me! The picture above is Fort Scammel which is located on House Island and built in 1808 as part of the national second system of fortifications - something I'll explain more about later in a future post that I have planned. 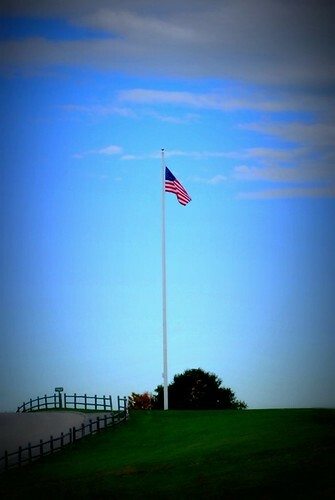 The fort was named after Alexander Scammell, Adjutant General of the Continental Army during the American Revolutionary War, who was killed in action during the Battle of Yorktown. Fort Scammell was the primary defense of Portland Harbor during the Civil War. Not that any Southern ships came up to attempt to attack Maine, mind you, but one could never be too safe from those rascally Rebels! 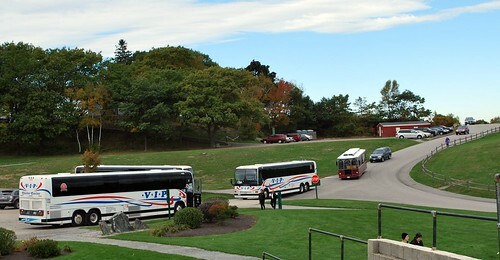 Maneuvering around the tour bus that had parked almost directly behind me and once again leaving the tourists behind, we continued south towards Two Lights State Park on Cape Elizabeth - which by the way was named by Captain John Smith in honor of Princess Elizabeth, daughter of King James I and Queen Anne of Denmark. 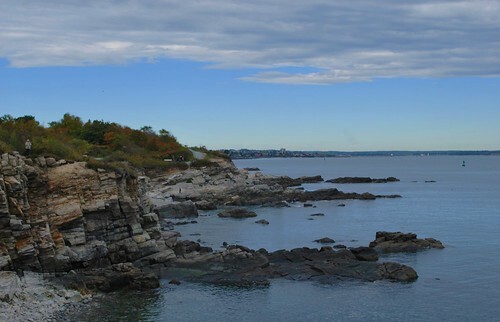 Two Lights State Park is the best spot to view Cape Elizabeth Light which was built in 1874 and automated in 1963. The lighthouse is located on private property as is its twin which was deactivated in 1924 when the government decided to convert all twin light stations to single lights. Both lights are 67-foot cast iron towers that were originally outfitted with Second Order Fresnel lenses. On December 20th, 1925, the east light was electrified and increased to 500,000 candlepower, which at the time made it the second most powerful light in New England after Highland Light on Cape Cod. The lantern was removed from the west tower during World War II when the tower was used as an observation post and it was after that the tower passed into private ownership. 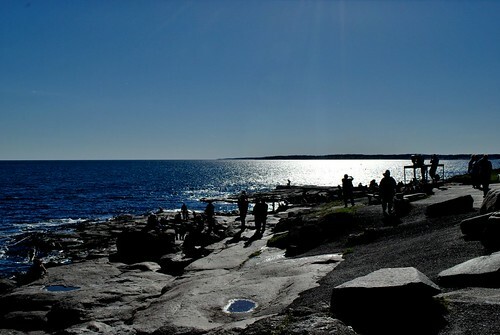 After the east tower's 1,800-pound second order Fresnel lens was removed in 1994 and replaced by modern optics, local residents lobbied for the preservation and display of the lens as it was the last lens floating on a mercury bath in use in New England. The lens is now on display at Cape Elizabeth Town Hall. 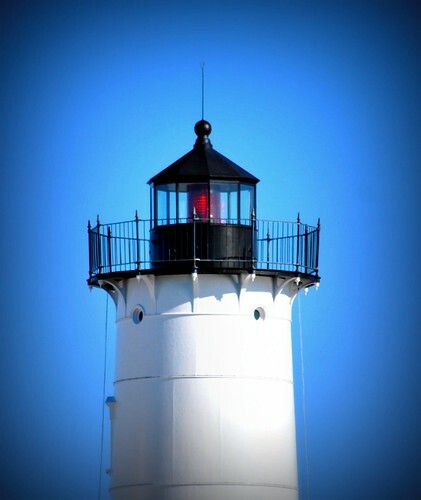 If you're interested in reading more about Cape Elizabeth's Two Lights, I highly recommend that you click on over to New England Lighthouses: A Virtual Guide where there are some very interesting stories about the history of the lights as well as some of its keepers. In particular the heroics of Marcus Hanna, who was a Medal of Honor recipient during the Civil War and keeper of the East Tower in 188,5 were quite an interesting read. Six months after a particularly bad winter storm during which Hanna saved the lives of two crewmen from a ship that had run aground on the reef, he received a gold lifesaving medal for "heroism involving great peril to his life" after what is regarded to have been "one of the greatest lifesaving feats at an American lighthouse." I think most of us tend to forget that job of lighthouse keeper held great responsibility as well as the potential to be quite hazardous but indeed it could be. 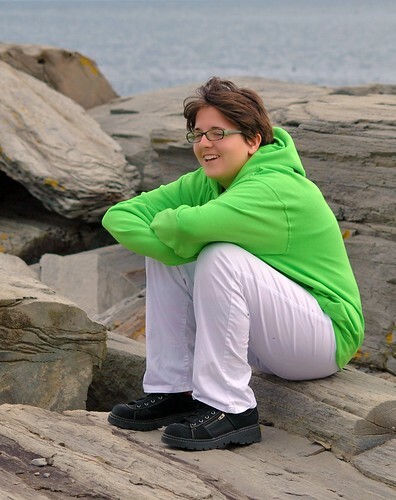 Initially when we got to Two Lights, Jamie opted to stay in the car with my mother but after I had gotten out and explored a little bit myself, I went back and asked her to come on over to the rock ledges with me as they were quite fascinating. Even though the ledges are made up of metamorphic rock, they look more like petrified wood and even feel more like wood than they do rock. Looking at the ocean in the area of Cape Elizabeth, I have to say that it was quite calm the day that we were there and the waves barely lapped against the rock ledges but I guess there is the potential for some horrific storms in the area and it was easy to picture the surf pounding against the "petrified wood" rocks. 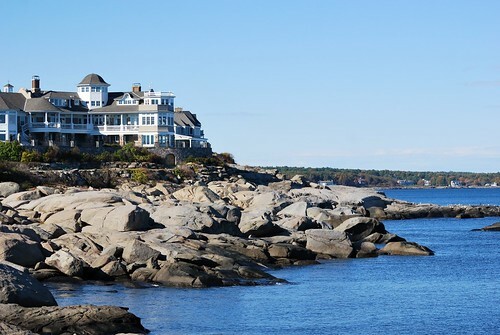 Honestly, the more I looked at it, the more beautiful the Maine coast became and I kept wondering why I'd never spent any time up there before. Well ... other than because Stephen King had scared the beejeebers out of me when it came to anything Maine related - something that Jamie still thinks is pretty funny as obviously she hasn't read nearly enough Stephen King to warrant looking over her shoulder for evil clowns every so often! Two Lights State Park was our last stop in the Portland/Cape Elizabeth area so from there we continued south down Route 1 where we stopped in Scarborough to visit with Lenny the Chocolate Moose and then stopped for lunch at a very nice 1950's-style diner before making our way to the last lighthouse on my list - Cape Neddick Light Station which is more popularly known as Nubble Light. 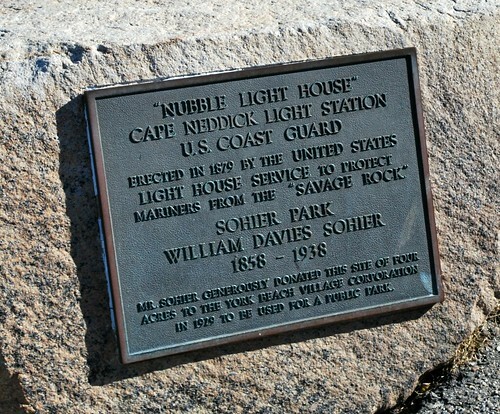 Even though mariners had been asking for a lighthouse on the "Nubble", a small, rocky island a short distance off the eastern point of Cape Neddick, since 1807 it wasn't until 1876 that Congress appropriated $15,000 for the building of a lighthouse. The 41-foot cast-iron tower, that is lined with brick, was first illuminated on July 1, 1879 using a fixed red light through a Fourth Order Fresnel lens. 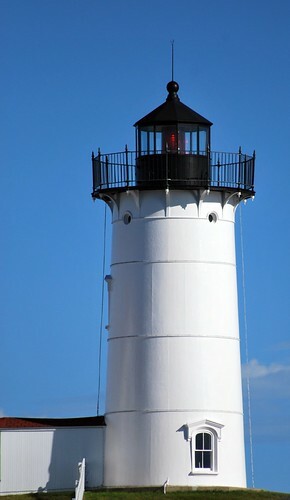 At first, the lighthouse was painted reddish-brown but the tower has been painted white since 1902. The fourth-order Fresnel lens currently in use is not the original one but is an 1891 lens that was moved from another station in 1928 after the original lens was damaged in an explosion. The lighthouse was automated on July 13, 1987 and the keepers were removed at that time. 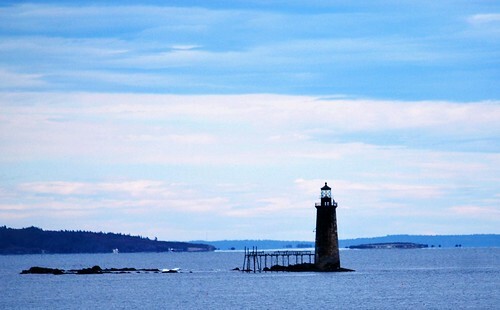 In November 1997, the people of York voted overwhelmingly to allow the town's selectmen to "adopt" the lighthouse and under the Maine Lights Program coordinated by the Island Institute, the lighthouse officially became the property of the town in 1998. 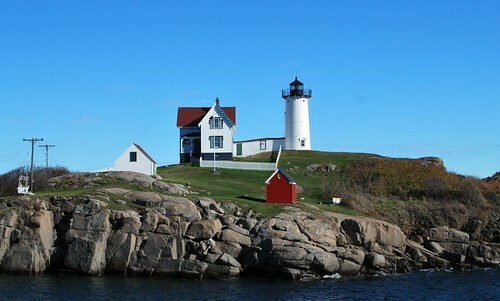 Another quintessential New England lighthouse, Nubble Light and its surrounding property has probably appeared on more postcards, calendars, and other souvenirs than any other New England lighthouse with the possible exception of Portland Head Light. 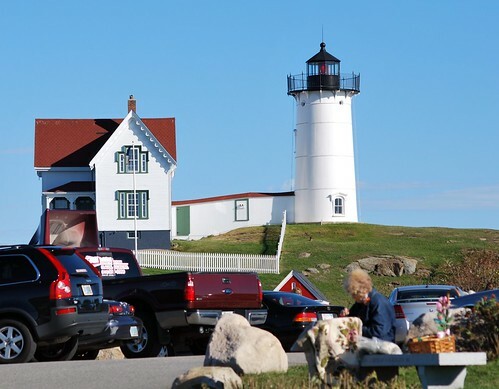 Hundreds of thousands of tourists make the short drive from popular York Beach to Sohier Park to view the lighthouse every year especially during the Annual Lighting of the Nubble which occurs twice per year when the houses and towers are outlined with white lights. This occurs on the first Saturday after Thanksgiving and again for Christmas in July for those who either aren't in the area at the time or would prefer to miss the nasty winter weather which can be quite cold and windy - especially at night when the lights are lit. I can't say that I blame her as I'm sure if I lived close by, I'd be spending a lot of time in the general vicinity myself! Add on the fact that it was a beautiful Sunday in York with nary a cloud in the sky - well, unless you count those barely visible ones over the light keeper's house in the picture below! - and who wouldn't have been at Sohier Park enjoying the sun and the view? Truth be told, I was probably darned lucky to have even gotten a parking space the lot was so crowded but fortunately there was a car from New York backing out of a space just in time for me to pull in. 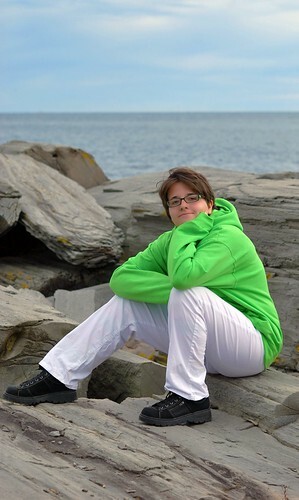 I even managed to get Jamie out of the car for this one without any coaxing on my part though she told me that she wasn't going to walk over to the lighthouse. I told her that was a good idea being that it's on an island and you can't walk over! The view above shows the rock ledges to the east of Nubble Light and I can only wish that I was lucky enough to be able to wake up to such a view every morning but alas, the view out of my windows looks nothing like that one! 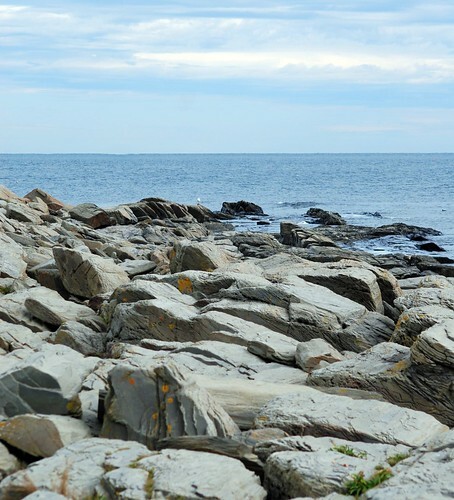 Again, if you think Maine, you may very well envision a coast that looks just like that one. It really is beautiful. Jamie and I decided to fool around a little bit while taking pictures of the light tower - which is only 41 feet tall but when you add on the additional height of the steep rocky island, the light is actually stands 88 feet above sea level and can be seen for 13 nautical miles. The light wasn't electrified until 1938 which incidentally is also when indoor plumbing came to the lightkeeper's house. I'm not sure if I were the keeper at the time which one I'd have been happier about but I'm definitely leaning towards the latter! After a few more pictures, it was time to leave Maine behind, wrap up the vacation, and head home via a quick stop in Massachusetts to drop a few things off at Montserrat and say 'hello' to Amanda. Even though we were a bit early for what could be considered peak foliage, from the mountains of Bethel and Rangeley to Acadia National Park to the quaint streets of Camden to the beauty of the craggy coast, I would have to say that I had an absolutely wonderful time visiting a state that I'd never really spent any time in at all despite its close proximity to Connecticut. Even though I had dragged her to covered bridges, state parks, and more lighthouses than I'm sure she really cared to see, I really think that Jamie had a good time, too. 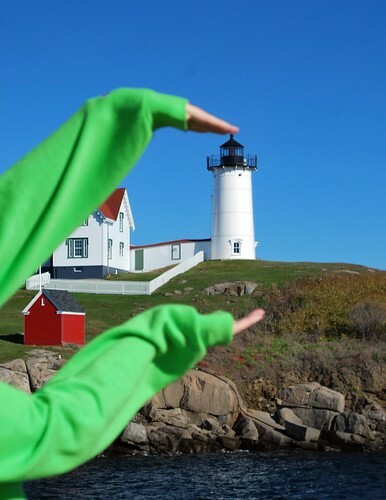 Now the question begs to be asked ... when am I going back up to Maine and searching out a few more of its more than 60 lighthouses and who wants to go with me?? Maybe my mom would be up for another trip next fall? All those lighthouses are so unique and picturesque. Love it! If I'm free, I'll go! Love, love this post! 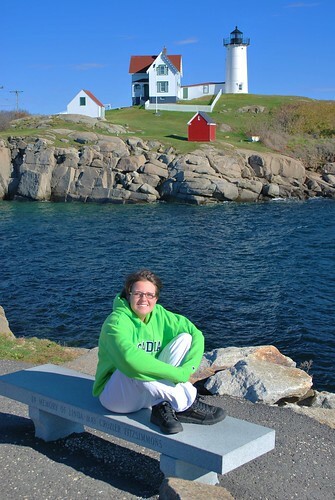 There is no such thing as TOO MANY lighthouse shots:) Especially Nubble, since it has a special place in our family. You always do a great job on the history lessons...and need to get paid for doing this!!! The pictures and story of your travels were excellent as always. One part I wouldn't have even understood except for one of Jimmy Buffet's novels read several years ago that revolved around the search for a Fresnel lens. boy howdy if you don't learn something when you come here you can't read! and where there is a cruise ship in port there are tour busses! and lots of them! well not so much in the caribbean but in europe? rows of them! What Empress Bee said. The learning part that is. I'll go with you next year. How fun. I love lighthouses a lot. What a fun trip. However, as always, you give great descriptions so I can visualise what I'm missing. You always get a pass from me on number of words and photographs because your historical essays are thorough and informative, and your photography is wonderful. And I was impressed with myself for the two or three pics I took of a lighthouse in Kaui'i! Oh, how I wish I lived closer so I could be your passenger, pointing and saying "Pretty" for a lighthouse excursion! 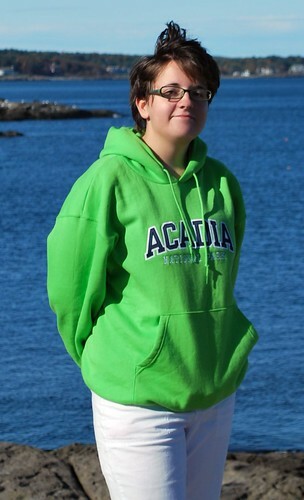 I've never been to see Nubble and I SO want to! So, next up is Salem? Have a fun trip! But bundle up, buttercup, cuz Baby, it's cold outside!